As general strikes and unrest erupts across Europe last week it is important to reflect on our recent day of action against Austerity. On the 20thNovember tens of thousands of people marched in cities across the UK against austerity and the recent passing of the devastating welfare reform bill. In Belfast, several hundred took part in a similar rally organised by the Northern Ireland Committee of the Irish Congress of Trade Unions. Far from showing any potential power these ritual marches from A-B ending with various sound bites and pitfall speeches from our trade union officials serve to reinforce a pervading cycle of powerlessness and are solution to defeating austerity. Also today the ballot figures from IMPACT were released. Members voted overwhelmingly in favour of strikes "if the Government moves to impose a second public service pay cut". The vote was 86% to 14%, with a 69% turnout. This compares to a 65% vote for industrial action – just short of the two-thirds required under IMPACT’s rules – on a 53% turnout in a similar ballot last March. 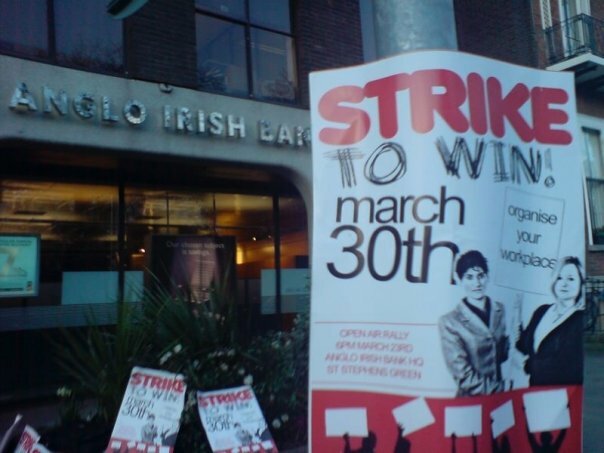 That the very threat of a national strike was enough to force government and IBEC to change their position demonstrates the power the working class holds when we threaten to withdraw our labour. For all the media attempts to convince us we are powerless and that class struggle is a thing of the past when faced with the reality of the organised working class standing up both bosses and state were keen to avoid any confrontation that could illustrate and encourage our collective power. The national strike called by ICTU should be just the first day of action in what must become a strike wave across every sector until all pay cuts are withdrawn. The super-rich can shoulder the costs of their crisis themselves.The bosses have spent months using the media to try and divide one set of workers form another and to set those still in jobs against the unemployed. They know that divided we are weak. March 30th is the moment we can throw that back in their face, a huge demonstration of class unity that can force them to back down or face the consequences. As soon as possible we need a unified day of strike action across the entire public sector to demand withdrawal of this pay cut. One day of strike action is unlikely to be enough to force a change of government policy. So this needs to be followed up with an ongoing campaign of strike action. Join us for the march on Saturday at the Parnell monument from 1.30. Did the idea of the so called 'Pensions Levy' come from some of the very Irish Congress of Trade Unions leadership who are supposed to negotiate on behalf of workers. This is one revelation that emerged on Saturday morning at a meeting of over 100 public sector trade unionists and two delegates from the Waterford Glass occupation. We were meeting in the Davenport hotel, Dublin to discuss a collective response to government attacks on workers and in particular the public sector pay cut. Most of those present were on branch committees or even national executives with a couple of branches delegating representatives to the meeting. The gathering could in that context be said to reflect the views of a large number of branches across the unions that organise public sector workers. A non-payment campaign has been launched by the Irish Congress of Trade Unions through 'Trade Unions Against Water Charges'. 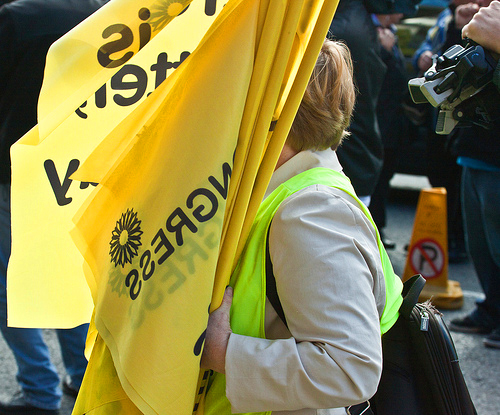 The campaign advocates non-payment of the water charges, which are due to be introduced in April 2007, as the best way to overturn the Government’s proposals.